This Karaf feature (odl-neutron-service) provides integration support for OpenStack Neutron via the OpenDaylight ML2 mechanism driver. The Neutron Service is only one of the components necessary for OpenStack integration. It defines YANG models for OpenStack Neutron data models and northbound API via REST API and YANG model RESTCONF. Those developers who want to add new provider for new OpenStack Neutron extensions/services (Neutron constantly adds new extensions/services and OpenDaylight will keep up with those new things) need to communicate with this Neutron Service or add models to Neutron Service. If you want to add new extensions/services themselves to the Neutron Service, new YANG data models need to be added, but that is out of scope of this document because this guide is for a developer who will be using the feature to build something separate, but not somebody who will be developing code for this feature itself. 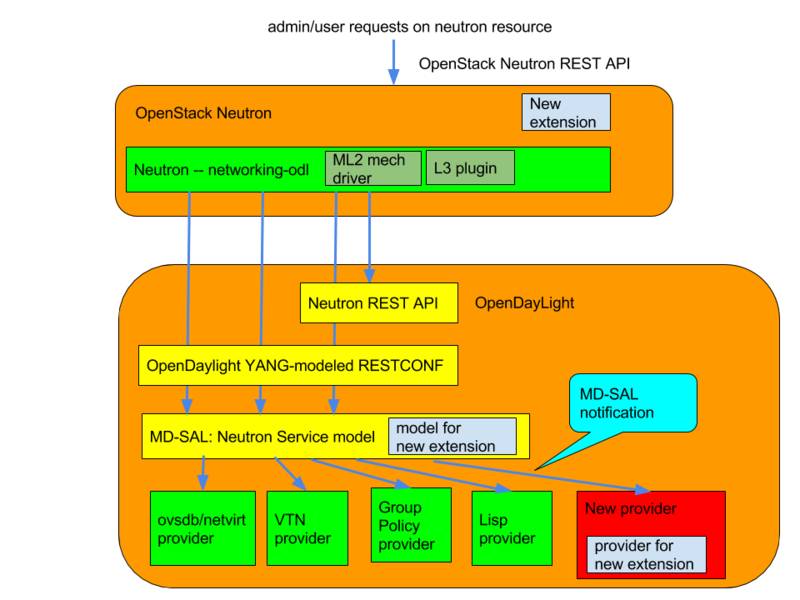 The Neutron Service defines YANG models for OpenStack Neutron integration. When OpenStack admins/users request changes (creation/update/deletion) of Neutron resources, e.g., Neutron network, Neutron subnet, Neutron port, the corresponding YANG model within OpenDaylight will be modified. The OpenDaylight OpenStack will subscribe the changes on those models and will be notified those modification through MD-SAL when changes are made. Then the provider will do the necessary tasks to realize OpenStack integration. How to realize it (or even not realize it) is up to each provider. The Neutron Service itself does not take care of it. Until Beryllium there was another way with the legacy I*Aware interface. From Boron, the interface was eliminated. So all the SB Neutron Consumers have to use Neutron YANG model. Currently there is no way to refuse the request configuration at this point. That is left to future work. From Boron, new models of configuration for OpenDaylight to tell OpenStack neutron/networking-odl its configuration/capability. This is for OpenDaylight to tell per-node configuration to Neutron. Especially this is used by pseudo agent port binding heavily. Each Neutron Service provider has its own feature set. Some support the full features of OpenStack, but others support only a subset. With same supported Neutron API, some functionality may or may not be supported. So there is a need for a way that OpenDaylight can tell networking-odl its capability. Thus networking-odl can initialize Neutron properly based on reported capability. There is another small Karaf feature, odl-neutron-logger, which logs changes of Neutron YANG models. which can be used for debug/audit. It would also help to understand how to listen the change.